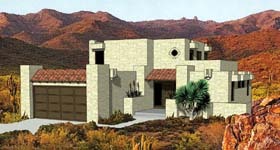 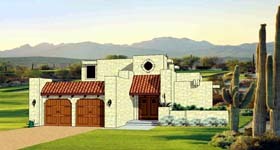 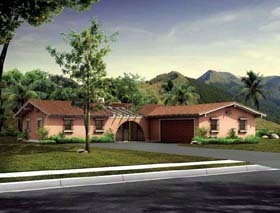 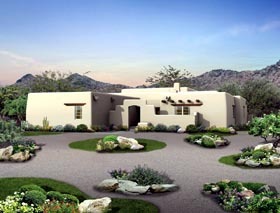 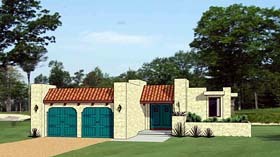 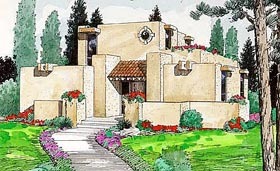 A combination of Native American and Spanish building concepts can be found in today's Santa Fe homes. 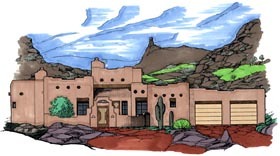 These earthy designs, sometimes called Adobe or Pueblo Revival Style, are named after New Mexico's capital city and appear throughout the Southwest. 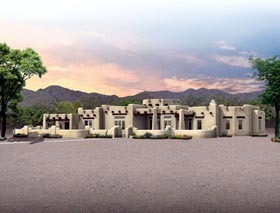 Often made of Adobe brick (sun-dried desert clay), these designs feature coarse log ceiling beams, tile floors, wooden lintels, flagstone patios, and flat rooftops. 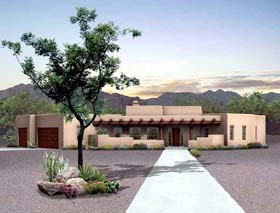 Cultural details include nichos (shelves carved into the wall) where religious relics can be displayed. 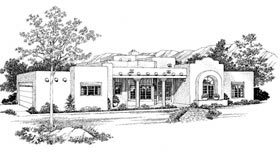 Fireplaces, called kivas, are shaped much like a beehive and positioned in the corner of a room, and the plan may also include built-in benches, called bancos.